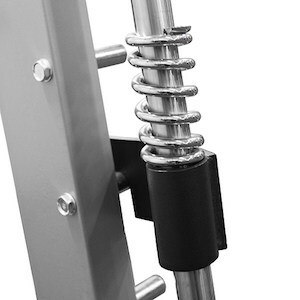 So, you’re in the market for a Smith Machine for your home gym? For novice or intermediate individuals, Smith Machines can be great for helping to build initial strength and muscle-mass, especially when used in equal combination with free weight setups, such as a good barbell set. For more advanced users, Smith Machines can be an effective way of augmenting strength and muscle gains achieved through dedicated free weight training. Good Smith Machines also improve the safety of weight lifting, especially for people who wish to workout alone. However, commercial Smith Machines (i.e., those made for constant use in gyms) are exceedingly expensive, and unsuitable for use in a home gym. 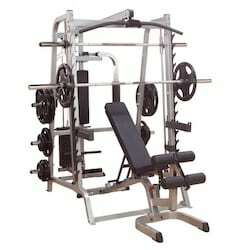 And residential Smith Machines (i.e., those made for use in home gyms) vary greatly in their style and quality. Without a good guide, you could end up dropping some serious cash on a machine that wears out long before you’ve got your money’s worth. Also, many of you will already be familiar with Smith Machines and the controversy that surrounds them, but for those who aren’t, we’ll go through the key issues at the end of the article. 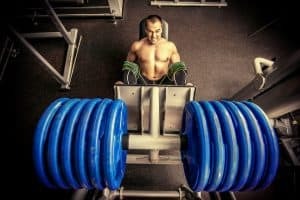 Smith Machines: What are They? Body-Solid are one of the leaders in home gym equipment because they simply make good quality stuff, and this Smith Machine is no different. 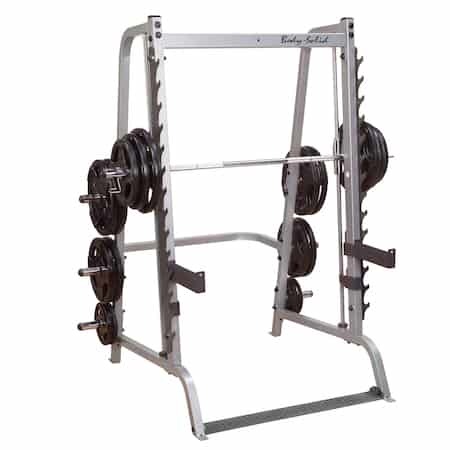 It has the combined strengths of a standard Smith Machine and a squat rack (aka ‘squat stand’, ‘half rack’ or ‘half cage’), as well as the ability to customize it according to your needs. The 25 lb. bar travels along the guide rods via linear ball bearing systems, which makes it very smooth and quiet and significantly better than the bushing systems used on other machines. It also has 20 standard lockout points along the frame for a nice and safe workout. 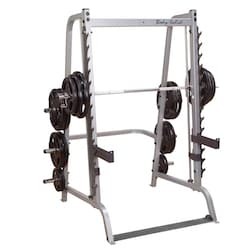 As mentioned, it also functions as a squat rack, with a free weight gun racking system that has 14 lift-off and racking positions and very solid 17″ safeties. This just makes it so versatile, and means that you can add a good Olympic barbell to the mix, and safely combine your free weight and machine workouts in the same space. 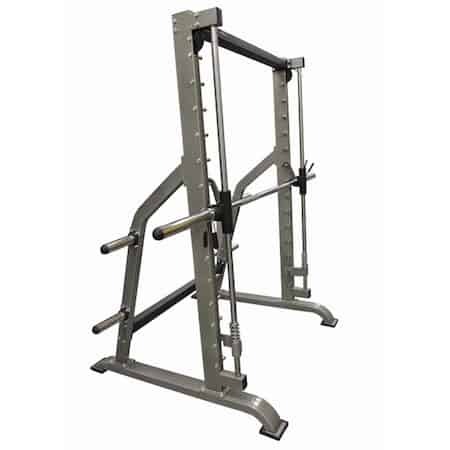 Unlike a lot of traditional Smith Machines, the Series 7 has a 7-degree reversed pitch, meaning the bar moves along a fixed path that angles slightly away from you from bottom to top. A reversed pitch is a more natural bar path, and heavy-duty home gym flooring; otherwise it could wreak havoc on your floors. Also, it’s quite a effort to get this thing assembled, partly because it’s so big, and partly because it’s complex and the instructions aren’t great. The manual takes you through a 9-step process, but only has exploded diagrams to guide you. Set aside at least half a day, take a careful and measured approach, and enlist the help of a competent friend or family member when putting the Series 7 Smith Machine together. Finally, the whole thing is designed for Olympic weight plates, which are not included. You can purchase the machine with 255 lbs of either rubber Olympic plates or steel Olympic plates directly from Body-Solid. With all of these inclusions, it becomes the all-in-one Smith Machine package that takes our #1 spot in the next section. As a standalone Smith Machine, it’s equally great and well deserving of a spot in your home gym. 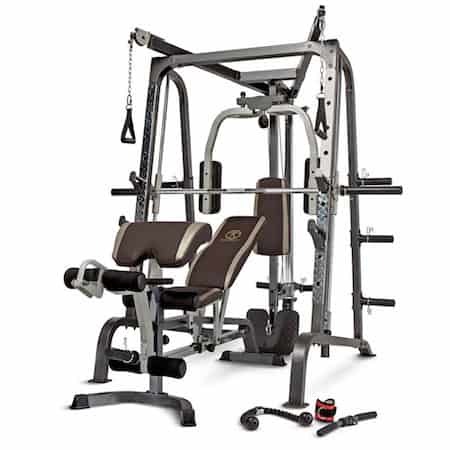 If uncomplicated is what you’re looking for, then the < a href="http://amzn.to/2IMwkSG" rel="noopener" target="_blank">#2 Valor Fitness BE-11 Smith Machine is a very good option. 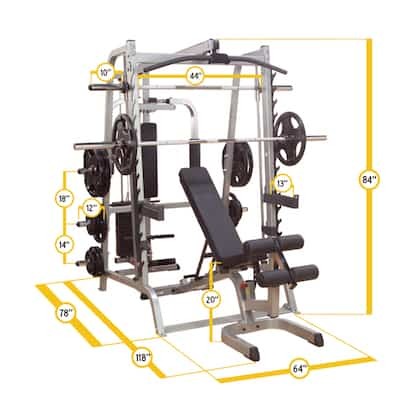 This is pure Smith Machine: No half-cage, no racking, no complex attachments (it does have an optional counterbalance kit, but more on that in a minute). 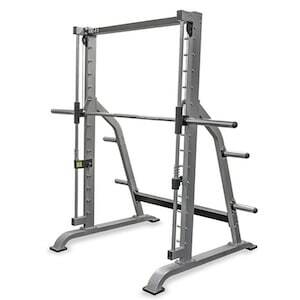 Although it’s simple, it’s also heavy-duty, very sturdy, and has all of the features you’d expect of a good Smith Machine. The 30 lb. knurled bar runs smoothly on the reverse-pitched guide rods via linear ball bearings. These are well made and work perfectly no matter how much weight you have loaded up (especially after a little squirt of WD-40). The safety latches are solid steel, and lockout at 14 different points along the frame. 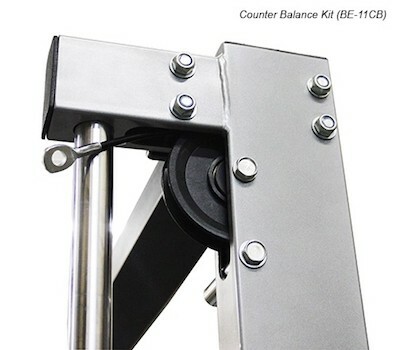 There are additional safety latches and springs that can be set separately at any height, and protect you if you do happen to fail a rep and are unable to latch the bar onto the supports. Another good little feature of this Smith Machine is that it can be used with either standard 1″ plates or Olympic plates (with 2″ holes). If you want to use Olympic plates, it has sleeves that fit onto the bar and storage pegs. Although these aren’t the highest quality (the plastic end caps can tend to pop off), they do their job just fine. Note: This machine does not come with weight plates – You will need to get your own. 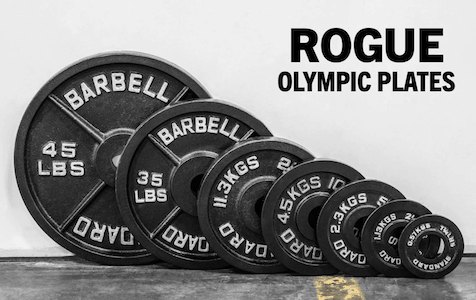 Check out these Olympic plates from Rogue Fitness, as they’re by far the best quality iron plates at a great price. 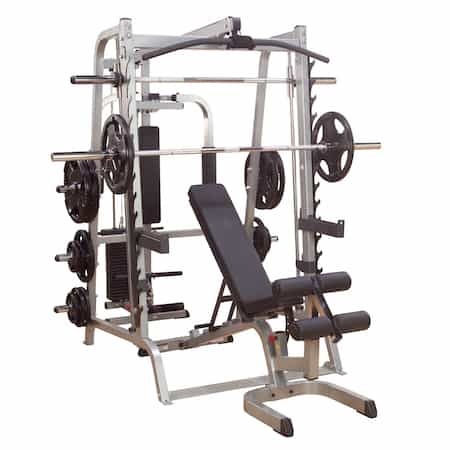 The Valor Fitness Be-11 has a significantly smaller footprint than the Body-Solid Series 7 (53″ long x 73.25″ wide x 80.5″ high), which gives it a compact look and feel, and makes it more suitable for smaller home gyms. Speaking of feet, although it does have rubber pads to protect your floors from the steel frame, we would still recommend getting some appropriate gym flooring to put beneath it. Its compactness does come at a cost though. The BE-11 isn’t particularly tall. If you want to do any overhead work (e.g., overhead presses), then you’re going to need to sit because the bar won’t go high enough to allow full extension of your arms. Tall people may even find that it won’t go high enough for calf raises. Another drawback of this Smith Machine is in the assembly. Although it’s a fairly straightforward piece of equipment to put together, the instructions do you no favors: Some steps are poorly explained and diagrammed. Moreover, some parts such as the lockout pegs require a bit of ‘persuasion’ to fit into the frame properly. We recommend having a small rubber mallet on hand to help with these. Once you get past those few difficult points however, its mostly smooth sailing and should take you 2-4 hours to have it fully assembled, depending on how mechanically inclined you are. All-in-all, the #2 Valor Fitness BE-11 Smith Machine is a tough, good-looking, good-quality Smith Machine that will provide you with the means to do great full-body workouts – nothing more, nothing less. The Caribou III is a good, compact Smith Machine that, like the Body-Solid Series 7, doubles as a power rack, and can be upgraded into a pretty badass all-in-one home gym package. 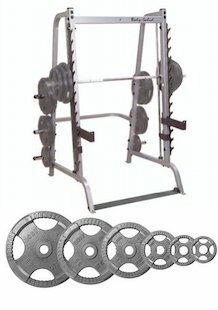 For a pretty reasonable price (~$700 – $800), it’s a decent Smith Machine + power rack combo, which is mostly well designed and constructed. Why do we say “mostly”? Because the Smith system that to attaches and tracks the bar along the guide rods uses Oilite bushings, as opposed to linear bearings like the two machines above. This design is said to be a unique feature of the Caribou III, which is correct, but not in a good way. The self-lubricating bushings work ok for lighter loads, but once the bar is well-used and loaded with heavier weights, the bushings don’t track as smoothly, and can “stick”. This interrupts the flow of repetitions and defeats the purpose of a Smith Machine. Yukon obviously recognize that this system is inferior, as they offer linear bearings as an upgrade. If you decide to go with the Caribou III, it’s definitely worth the extra ~$200 to upgrade to linear bearings. Aside from this, the Caribou III is a worthwhile piece of equipment. It’s made from good quality 12-guage steel, and should support in excess of 800 lbs. The power rack has dual bar holders as well as safety spotter arms that can be adjusted to 22 different height positions. Add your own barbell, and you’ll be able to move easily between free weight and Smith Machine lifts. 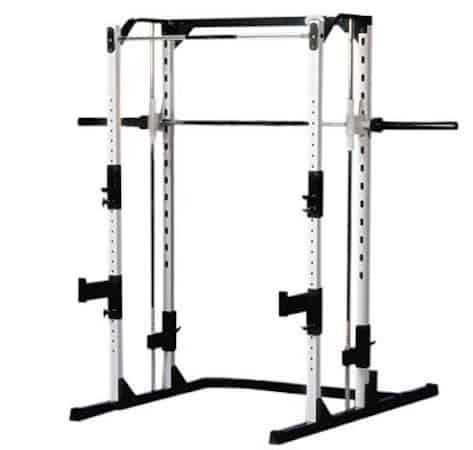 Unlike many other Smith Machines, the Caribou III Power Rack also includes a chin up bar, so you can throw in bodyweight exercises to ensure you get a nice and varied workout. Plus, it has a fairly small footprint (68″ long x 48″ wide x 82″ high) making it a solid option for smaller spaces. Our honest view is that fully upgrading this machine doesn’t offer anything exceptional, and isn’t a good use of money. The Marcy Diamond Smith Cage System will actually give you a comparable all-in-one package that’s better quality and lower cost. 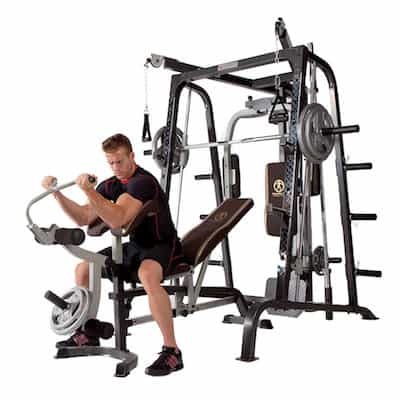 However, if you’re simply after a sturdy, standalone Smith Machine that’s functional and compact, then we think you’ll be pretty pleased with Caribou III standalone Smith Machine option from Yukon Fitness. We know it may seem a bit odd having the same machine at #1 in both sections of the same article, but you’re very much looking at the clear leader in residential Smith Machines. Adding on the various attachments available for the Body-Solid Series 7 takes it from a very good, functional Smith Machine + squat rack, and turns it into a genuine beast – one that provides almost everything you’d need / want from a gym, in a single piece of equipment. We’ve previously reviewed the best home gyms, but this all-in-one package takes things to the next level. Everything we said about the Body-Solid Series 7 standalone Smith Machine obviously still applies, so we’ll focus on what you get from the attachments. The primary add-on is the Lat pulldown attachment. It includes the 210 lb. 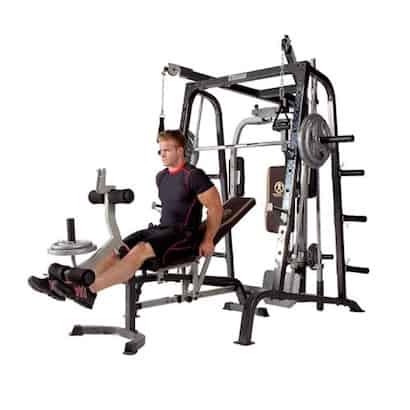 selectorized weight stack, as well as the low row straight bar and foot brace, which allows upright and seated rows, and bicep curls. The pulley system is smooth and quiet, and as good as any multi-stationed gym. It should last a long while before wearing out. Although installing this attachment can get a bit fiddly, you should be able to get it done without too much trouble. One of the great things about this attachment is that the weight stack has additional weight posts that can hold Olympic weight plates. This greatly increases the amount of weight you can lift, and means you can continue to develop your strength beyond the initial 210 lbs. The next major attachment is the pec-dec station. There isn’t a huge amount to say about this add-on other than it meets the same standard of quality as the rest of the machine and allows you to build variety into your workouts. It uses the selectorized weight stack that comes with the lat pulldown attachment, and can be adjusted to perform standard bi-lateral and unilateral pec decs (flyes), as well as reverse flyes. These will help you develop balanced strength and musculature in your chest, shoulders, and upper back. The last attachment is simply the addition of the heavy-duty >adjustable utility bench with leg developer. You can set this to flat, incline or decline to allow the full gamut of bench press variations with either the Smith bar or a free barbell, and / or add weight plates to the front post in order to use the leg developer. Frankly, it’s a solid bench that obviously fit perfectly into the Smith Machine, and performs its function with fairly little to complain about. It is a lot of machine, and the attachments only make this thing even bigger. Do not purchase this machine if you only have a small area in which to put it. The instructions aren’t great. This is all the more noticeable when installing the add-ons, especially the lat pulldown. Some of the rubber/foam padding is stick-on, which is a little disappointing considering the great quality of the rest of the machine. All-in-all this is an immensely good and useful piece of equipment. It is almost a complete commercial gym, as far as strength training goes anyway. Yes, it’s going to set you back a few grand, but that will be one of the best, most well-rounded investments in your health and fitness you could possibly make. 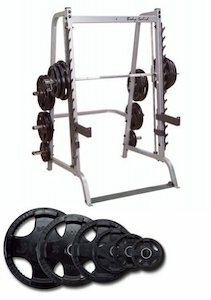 “A very good product for a very reasonable price” is probably the best way to describe this all-in-one Smith Machine / half cage / home gym system from Marcy. If you have the space but not the money for the Body-Solid Series 7, then you should definitely consider this bad boy. While it’s not quite the light commercial quality of the Series 7, its clever design and solid construction should ensure you get years of regular use from it. The frame is heavy and stable, and once fully assembled will stay exactly where you’ve built it – no sliding or wobbling. All of the components, including the cables and pulleys, are high quality. If assembled and used correctly, and maintained appropriately, then we don’t see you having any issues with premature breakdown. 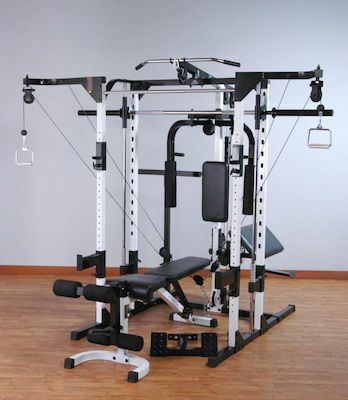 The Smith Machine uses solid linear bearings, which give it a quiet and smooth operation. These attach the bar to steel guide rods angled at a 7 degree reverse-pitch. It has a standard safety catch mechanism that can be locked onto 14 different points along the frame with a quick turn of the wrist. 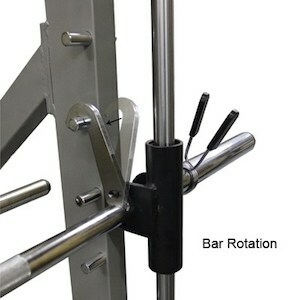 There are also adjustable safety catches for both the Smith Bar and a regular barbell. 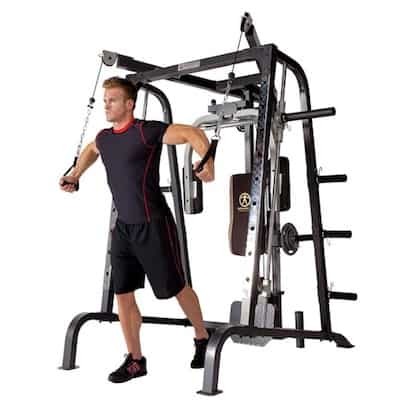 Lat pulldown bar, pec dec, low row and cable crossover stations all attach via cable to weight posts that can be loaded up with 2″ Olympic plates. 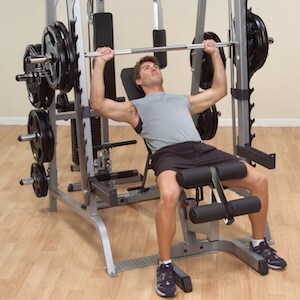 An adjustable utility bench with preacher curl attachment and leg developer is also included. It also has some flaws in common with the Series 7 above. Firstly, it’s very big. With a footprint of 86″ long x 79″ wide x 84.5″ high, it’s a large machine that requires a lot of room. You’ll need at least a foot on either side and behind it to allow you to get weight plate on and off the bar and posts, plus a couple of feet in the front in order to use the bench properly. Also, if you’re going to use a free-weight barbell and store it in the built in vertical holder, then you’re going to need about 96″ height clearance in order to get your barbell in and out of said holder. Secondly, it’s a pretty complex machine, and like the Series 7, the instructions provided by Marcy aren’t great. Even with another person helping you, expect to take between 6 – 10 hours to have it fully set up. Even more so than the Series 7 however, this Marcy Diamond Smith Cage System requires a systematic and patient approach. Ensure you lay out all the components as well as the nuts and bolts before you start, otherwise they’ll become impossible to keep track of. Finally, it weighs about 380 lbs fully assembled, and the rubber feet it comes with are not very good. 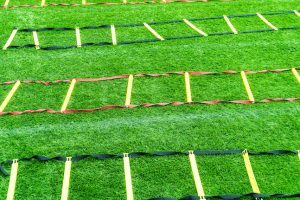 Therefore, you’re definitely going to want to invest in some good quality gym flooring. As with most Smith Machines, it doesn’t come with a free-weight barbell or weight plates included, so you’ll have to get your own barbell set. Although the cost of this machine will extend beyond the base price (which is pretty standard), you’ll still end up paying considerably less than many other options. And while this lower cost comes with slightly lower quality, the Marcy Diamond Smith Cage System is still a very good product for a very reasonable price. The Smith Machine came into existence in the 1950’s when Jack LaLanne (sometimes referred to as the Godfather of Fitness” or “First Fitness Superhero”) out a design for a self-stabilizing squat rack on the back of a napkin and showed it to his discerning friend, Rudy Smith. LaLanne gave Smith permission to develop it into an actual machine, and less than a decade later it was being mass-produced and sold. 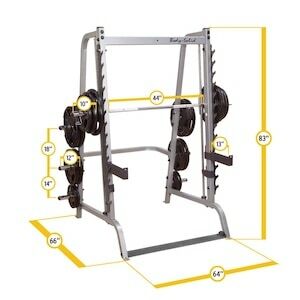 The modern Smith Machine generally consists of a barbell attached at each end to a vertical steel rod. The rods act as guides, allowing the bar to move along a single fixed path, up and down. The ends of the bar are loaded up with weight plates, just like a regular barbell. Also attached to the bar are hooks that, with a turn of the wrist, can be latched onto lockout points along the length of the machine’s frame. Today, it’s a feature in most gyms the world over. Like it or lump it, the Smith Machine is here to stay. Criticisms of Smith Machines generally center on their use for performing squats and bench presses in comparison to using a regular barbell. 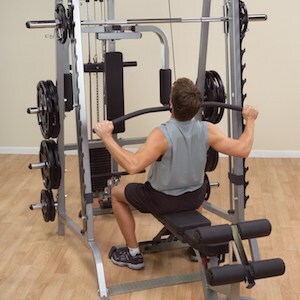 It’s claimed that the Smith Machine’s fixed path of movement is unnatural and creates stress on the knees and/or back when squatting, and on the shoulders when bench pressing, thus increasing the likelihood of injury. Additionally, there is a widely held belief that because the Smith Machine bar is prevented from moving backwards and forwards, the body doesn’t have to activate the stabilizing muscles in the legs and trunk when squatting. Barbell squats and bench presses, on the other hand, are said to require stabilization of the bar in all directions, and therefore activate more muscles, especially the stabilizers. Proponents for Smith Machines argue that their design makes them significantly safer than free moving barbells. The reduced need to stabilize the bar in all planes of movement (and therefore activate fewer muscles) is said to actually reduce the likelihood of injury. Similarly, being able to lockout the bar at numerous positions means that a failed rep is significantly less likely to result in the bar crushing the user, thus reducing the need for a spotter and increasing safety for people working out alone. Smith Machines are simpler to use than free barbells. They require less skill development through learning and repetition of proper technique. For this reason, they’re considered more suitable for novices and those rehabilitating injuries. This is not to say that there are no dangers in using Smith Machines. Case studies and notable lawsuits demonstrate the injuries that can occur from using Smith Machines with little skill and too much weight. It’s also generally claimed that heavier absolute loads can be lifted on Smith Machines, meaning that while there’s less stabilizing muscle activation, there can actually be greater primary mover (e.g., quads, glutes, pectorals etc.) activation, leading to improved strength and mass in these muscles. Science has tried to weigh in on the debate, but has so far failed to provide any conclusive answers. Admittedly, there is very limited research that has assessed the various claims made for and against Smith Machines, but the studies that do exist have so far produced mixed results. For example, a study comparing free weight and Smith Machine squats, found free weight squats produced greater activation of the prime movers in the legs, and one leg stabilizer, than Smith Machine Squats. 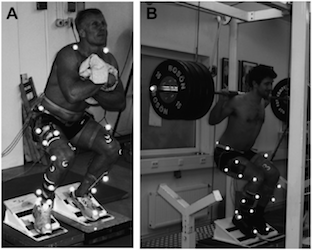 However there were no differences in activation of trunk stabilizers between free weight and Smith Machine Squats. This runs counter to some of the most prominent claims for and against Smith Machines outlined above. Similarly, another study comparing Smith Machines and regular free weights in terms of the amount of force produced by the muscles involved in bench presses and squats found very inconsistent results. In the research participants it was found that bench presses using free weights produced greater muscle force than those using a Smith Machine. Muscle force production during squats, however, was greater when using a Smith Machine than free weights, but only for women. On top of the fact that the results of scientific studies have been mixed, the validity of the studies themselves have been called into question. It has been pointed out that most studies comparing Smith Machines to free weights have used methods of assessing muscle activation and force production that are potentially inaccurate and misleading. This shows: 1) More good quality research is needed to understand the true performance differences between Smith Machines and free weights; and 2) things are not as straightforward as some (on both sides of the Smith Machine debate) would have you believe. as effective as free weights in developing strength and muscle-mass. Plus, they increase safety and reduce the risk of injury, especially for people who do solo workouts. But, like any tool, they have suitable and unsuitable uses. 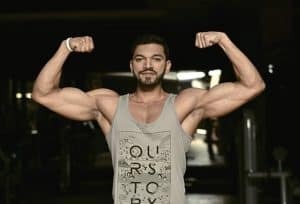 Step into any gym, anywhere in the world, and there’s a good chance that you’ll see experienced lifters, with well-developed strength and musculature, using Smith Machines in their workouts. Even the great Arnold Schwarzenegger advocates for the use of Smith Machine lunges to build strength and muscle. Using a Smith Machine in conjunction with other strength training methods, including free weights and bodyweight training, is a suitable use of the tool. Many lifters, for example, use a Smith Machine to perform Hack Squats to isolate their quads and take them to complete failure after doing barbell squats. Similarly, athletes who are rehabbing injuries often use Smith Machines to help rebuild strength and minimize the risk of re-injuring themselves. This is another suitable use of the tool. However, exclusively using a Smith Machine for your strength training is an unsuitable use of the tool. If a Smith Machine is the only weightlifting equipment you have access to, then at least do bodyweight exercises that target the same muscles. Likewise, if you’re a beginner who has not learnt proper form, loading up a Smith Machine and pushing yourself with exercises like squats and bench presses is another unsuitable use of the tool. Smith Machines are generally safer than regular barbells, but they aren’t without risk. 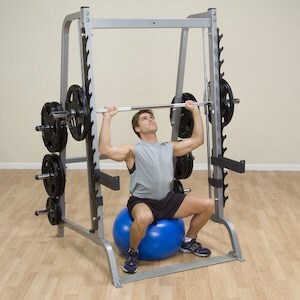 There are numerous well documented cases of serious injury resulting from improper use of Smith Machines. The reality of using Smith Machines is that when used properly, they’re an excellent piece of equipment for building strength and muscle. And, if you learn how to use them properly, and you’ll have yet another tool in your strength training tool belt. Well, there you have it: The best Smith Machines for your home gym. Whether you’re after a standalone Smith Machine to complement your overall strength training routine, or all of your equipment in a single, all-in-one package, one of the above products should meet your needs. We’ve also run through the history and basics of Smith Machines and talked through the key points of the debate that often surrounds them. Our view is that they’re just one among many strength training tools at your disposal, and should be used accordingly. If you found this article useful, why not share it with your friends and family on social media? If you have any questions or comments, please share them below as we’d love to hear from you.